TERTULLIAN (USA) (Chestnut 1995-Stud 2002). 12 wins to 1500m, Longchamp Prix de la Porte Maillot, Gr.3. Half-brother to SW Terek and SW Tusculum. Sire of 296 rnrs, 197 wnrs, 16 SW, inc. Guiliani (Munich Grosser Dallmayr Preis, Gr.1), Mawingo, (Mr) Irian, Aviso, Russian Tango, Illo, Eric, Illiana, Diatribe, Tertio Bloom, Kerosin, Baiadera, Belango, Tuliangreen, Idolino, Beltanus, SP Guizot, Niyama, Gauguin, Olala, Ninas Terz, Russian Bolero, etc. Nacar (c. by Tertullian). Placed. See below. Navio (c. by Dai Jin). 2 wins at 2200m, 2300m in 2016 in Germany. Neria (f. by Tertullian). Winner at 1600m in Germany. Nacida (f. by Wiener Walzer). Placed at 2 in 2016 in Germany. Nacella (Banyumanik). 3 wins. See above. Neve. 2 wins-1 at 2-at 1400m, 1500m to 2016 in Germany, 2d Hoppegarten BBAG Auktionsrennen, 3d Dortmund Grosser Preis von Wilo, 4th Düsseldorf Preis der Dreijährigen, L.
Naval. 4 wins from 1300m to 1600m in Germany. Narita. 4 wins at 1700m, 1900m in Germany. NARANJA, by Athenagoras. Unraced. Dam of 3 foals, none raced. NORM, by Soderini. 3 wins in Germany. 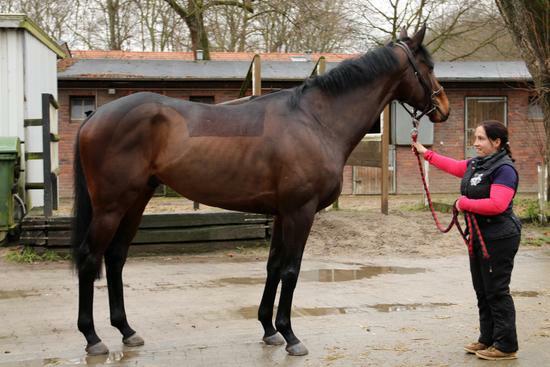 , Half-sister to NEPHRIT, Nauarchos, Niederrhein, Nuphar, Note (dam of NETWORK, NOVELLO). Dam of 7 foals, none raced. Race Record: 7 Starts 0-4-1 €22,400. Placed at 2 & 3 to 2016 in Germany, 2d Munich Bavarian Classic, Gr.3, 3d Dortmund Grosser Preis der Wirtschaft, Gr.3.